It’s wonderful to be here in Paris—the City of Love & Light—for COP21. Signage about the UN conference from Monday 30 November until Friday 11 December is everywhere. So are police and gendarmes patrolling the streets and metros following the horrific terrorist attacks of Friday 13th November. As anxious as Parisians may be feeling now, the elegance and grace of this ancient city and its people is still shining through the dark shadow. The French government’s response to the terrorist attacks has been to outright ban all public gatherings and demonstrations for the next three months. While we respect that governments must take measures to ensure the safety of their citizens and visitors, we also note that in recent months the French government had started taking unprecedented measures to limit civil society demonstrations. For instance, ordinary people were required to apply for ‘visas’ in order to attend rallies, marches and demonstrations held during COP21. As if attending a peaceful protest isn’t a basic democratic right? It’s relevant to revisit what happened during COP15 (Copenhagen, 2009), which saw the first global mass mobilisations of civil society around climate change. Under pressure from delegates of powerful nations, organizers locked out community groups. But not the vested interests—the fossil fuel industry lobbyists and their financiers. What are citizens to do when their leaders continue knowingly acting against their best interests? For instance, is it not perverse in the extreme that Paris climate negotiations are being sponsored by major polluters? Proud among them is Engie, the rebranded Paris based GDF Suez whose negligence was found by an Inquiry to have led to last year’s tragic Hazelwood mine fire that blanketed Victoria’s La Trobe valley in toxic ash, smoke and carbon monoxide. For the record, Engie refused to cover the Country Fire Authority’s expenses of $18 million after 7,000 of its volunteer firefighters fought for 45 days to control the fire. 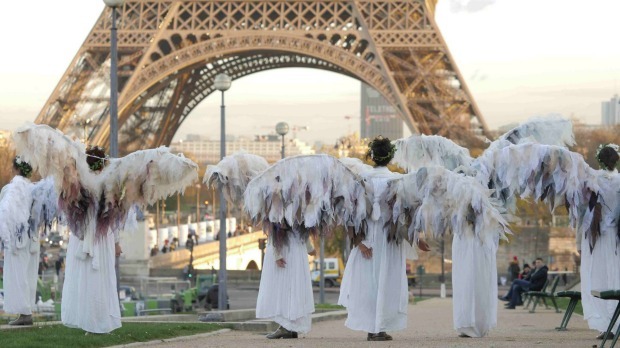 Regardless of the crackdown on civil society during COP21, with utmost consideration for how Parisians are now feeling, Climate Guardians will be proceeding with their uniquely effective performance art activism. After all, what could possibly be threatening about a small group of women aged between early 20s and mid 70s beautifully dressed as angels, right?